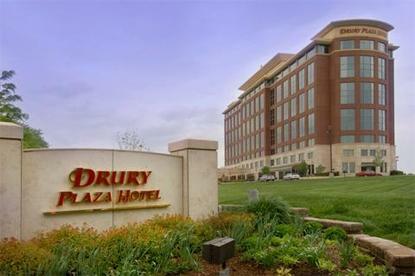 THE DRURY PLAZA HOTEL CHESTERFIELD COME AND VISIT OUR NEWEST HOTEL IN THE ST. LOUIS METRO AREA. GET YOUR EGGS HOW YOU REALLY LIKE THEM? FREE. CHOOSE FROM SCRAMBLED EGGS, SAUSAGE, PANCAKES, BISCUITS AND GRAVY AND MUCH MORE DAILY WITH FREE HOT QUIKSTART BREAKFAST. CHOOSE BETWEEN A KING OR TWO QUEEN-SIZED BEDS IN OUR 275 GUESTROOMS OR TRY A SPACIOUS 2-ROOM SUITE. ALL SUITES HAVE TWO SEPARATE ROOMS - A BEDROOM AND A LIVING ROOM SO YOU CAN HAVE THE SPACE, COMFORT AND PRIVACY YOU DESERVE. ALL ROOMS COME WITH A MICROWAVE AND REFRIGERATOR. DRINKS ARE IN THE LOBBY AND ON THE HOUSE WITH FREE EVENING BEVERAGES NOW SERVED 7 DAYS A WEEK FROM 5:30-7:00PM. CONVENIENTLY LOCATED AT I-64/40/61 AND CLARKSON ROAD WITH EASY ACCESS TO AREA ATTRACTIONS, RESTAURANTS AND SHOPPING.